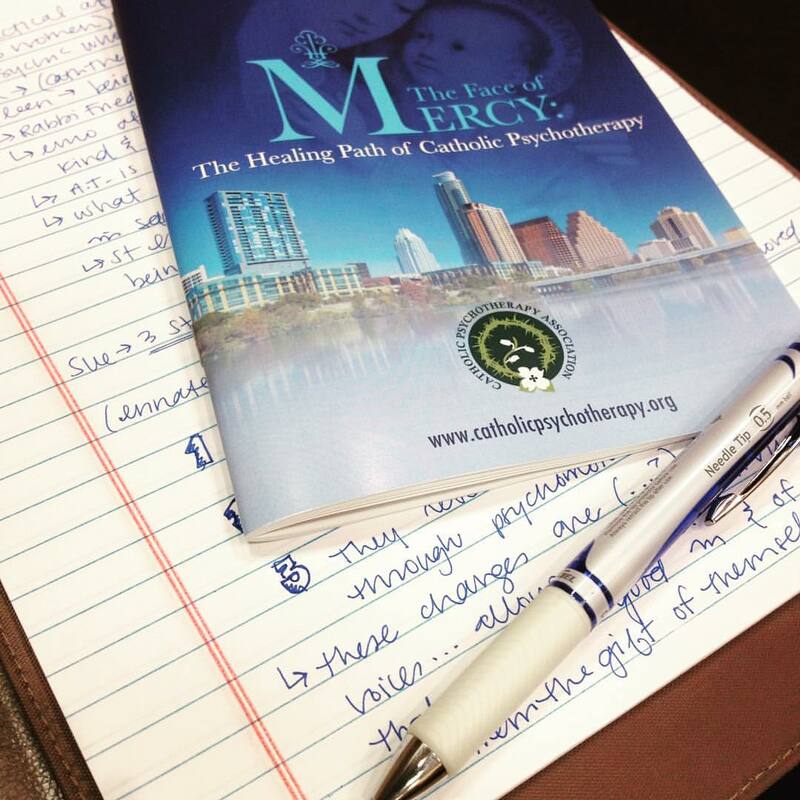 These are my take-a-ways from the annual Catholic Psychotherapy Association Conference, The Face of Mercy: The Healing Path of Catholic Psychotherapy, which happened in Austin this past weekend. I’d like to distill a bit of the core message I experienced, and at the end, I’ll also share a few of the great resources we were given (Disclaimer – these are just the initial, broad brushstrokes of my impressions, I lack more reflection and serious study to distill all the good information that was presented). Christ endured the cross for the joy set before Him, that is, He endured suffering out of an incredible abandonment to the divine Love of God, knowing that His good Father would bring new life and joy out of the pain and suffering. And if as therapists, we too allow ourselves to be caught up into that Pascal Mystery in our own suffering, we will slowly grow the spiritual muscle (which is more, I think, about the strength to abandon oneself to God), that will enable us to speak with the authority of hope and peace to people in the midst of suffering. Since Christ came, the human person is no longer confronted with meaningless suffering – or rather, all suffering that is senseless can be transformed in Christ, that we may have the strength and endurance to let ourselves be transformed by the suffering. This means for me that we can also approach with deep reverence and respect the suffering of the other – we do not need to anxiously attempt to mitigate all symptoms, but rather lend a calm and warm presence, where, connected to the other, we can open the space for the other to interpret, understand and make use of the painful moments in life towards his/her own life aspirations and values. This may seem like a lofty call for us as therapists, but it’s really the same call Christ gives to every Christian, each in his/her own measure – come, take up your cross, and follow me – not just into the grave of dying to self, but into the glory of My resurrection. I was really struck by Fr Paul Check’s living example of this. When a woman in the conference asked a very tender and personal question of suffering during a Q & A session, Fr Paul responded with deep compassion and peace. He was not anxious, he was clear, and you could sense the warmth in his voice. In response to her vulnerable question, he gently offered her the Pascal Mystery, and in this he offered her strength, hope and compassion, while at the same time respecting her own free will choice to take up her cross, to take up her part in the Mystery. I think he lived out a small, beautiful example for all of us there. That’s what we’re going for- fully alive! Transformed, transforming, growing. As Jennifer Madere said, we are called as therapists to remove the obstacles to growth, to help heal the psychological foundation of the human person, so that from solid foundations, a greater life in Christ may flourish. Our goal is not a symptom free life of indulgence, according to the pleasure principle that “feeling good” is the ultimate meaning of human existence, and the relativistic approach of “anything goes”. 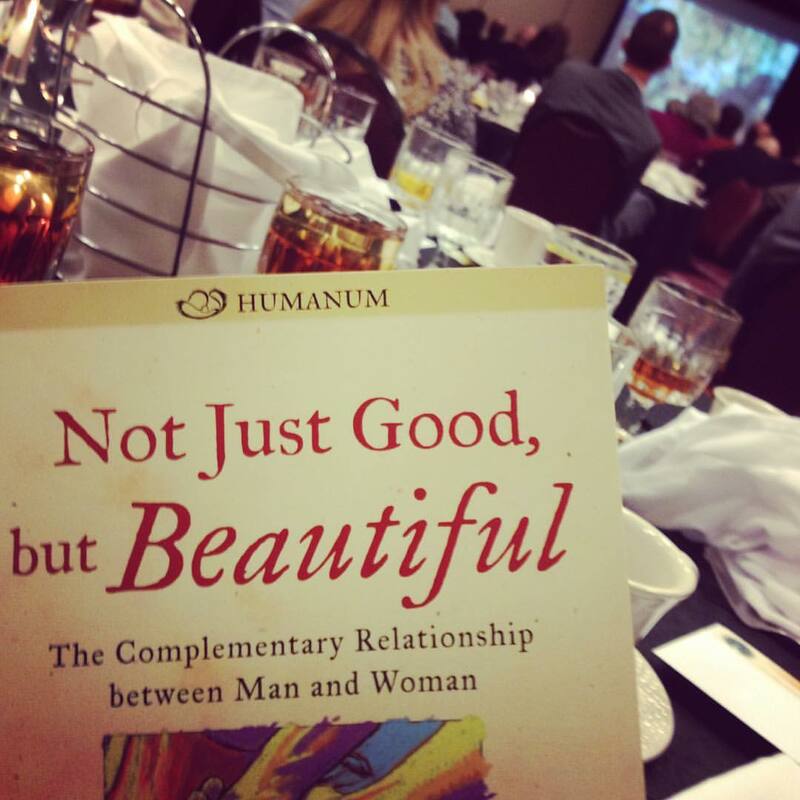 We’re going for a human person fully alive – to walk with others in such a way that they may grow to better walk their own calling before God as His child, reaching towards the fullness of their life missions, whatever that may be – in pleasure, joy and pain – through desolations and consolations, in the midst of complex and transforming human relationships. It is to walk with them as they embrace the Pascal Mystery in their lives. And that full life, that transformed life, gives great GLORY to God. The second thread showing the difference it makes to be a Catholic psychotherapist, was woven through the conference in a much more subtle way- The image of Mary! Mary, Mother of Good Counsel, is the image and patroness of the CPA. And her image was present throughout the weekend. 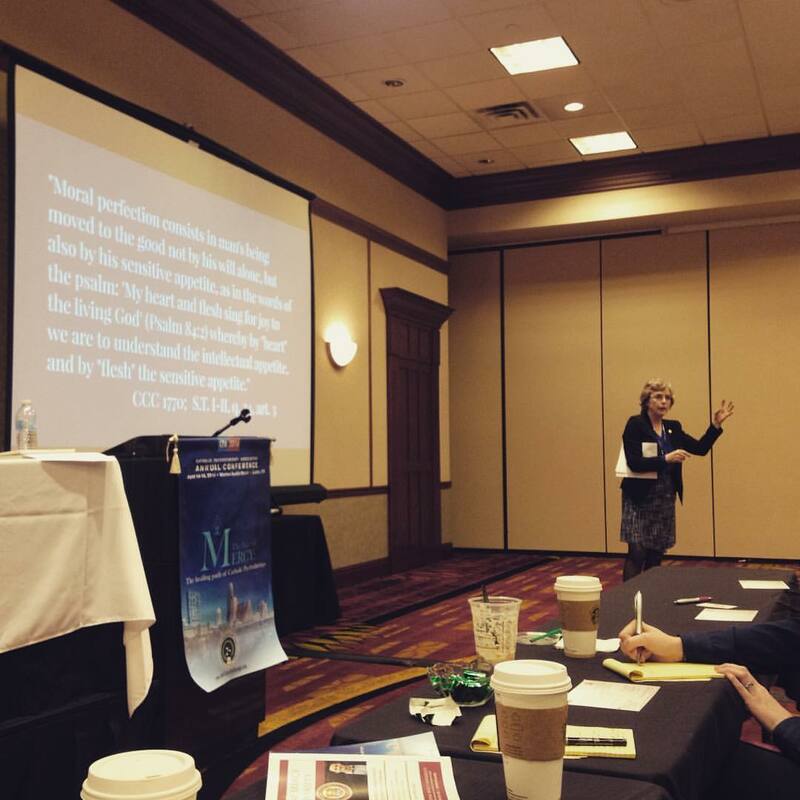 And what does Mary have to teach us as Catholic therapists? Mary is, by God’s design, the humble intercessor, the faithful mediator of grace for all the children of God. How is she a model for us as therapists? Like Mary, we can intercede for our clients by praying for them, by offering their lives silently to Christ. Ultimately, they are all children of God whom He has entrusted temporarily to our care. Like the Blessed Mother, we have no merit of our own. We are no different than our clients in that we are all pilgrims on a journey, sinners ever on the road to sanctity. This dispels the fallacy of the doctor-patient, the hero-victim, the savior-saved. We know who the real Savior is, and we allow Him to work! And at the same time we can know our own role – we have been given a calling, and we have been entrusted both with a license, and with the hearts of those who come to us. Like Mary, our task is to be humble, faithful, transparent conduits of all the good graces that come from God. To give our full yes! 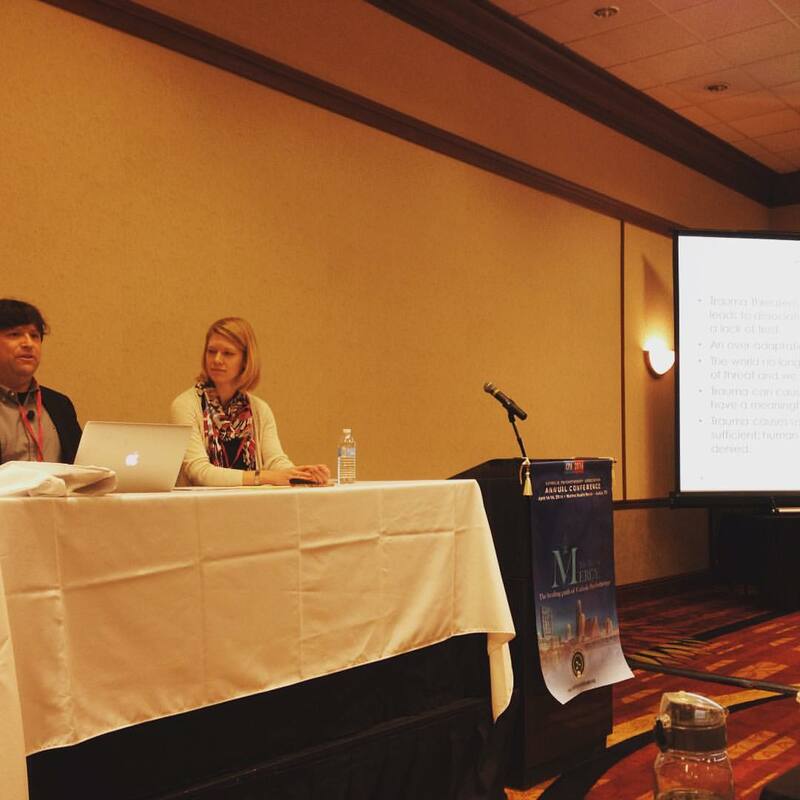 I like the way my supervisor, Dr Leah McDill, often says it – we are called to be good stewards of our license, stewards of our practice. If I as a therapist have it clear that it is Christ who saves, it is the Spirit who heals and transforms, and it is the Father who is ultimately in charge, then I can work incredibly efficiently and fully possess my own efficacy as a therapist, and at the same time not be seduced by thinking that I am responsible for changing or healing the other directly. For just as God wholly respected Mary’s free yes to her own mission, and just as He respects our yes, so we must respect the yes of our clients, that is, his/her full decision to participate in the healing process out of his/her own responsibility and calling. And like Mary, that reverence for the freedom of the other is not a cold, disconnected, formal respect, but rather a deep, warm, and connected reverence – a vital relationship that has the power to move hearts. 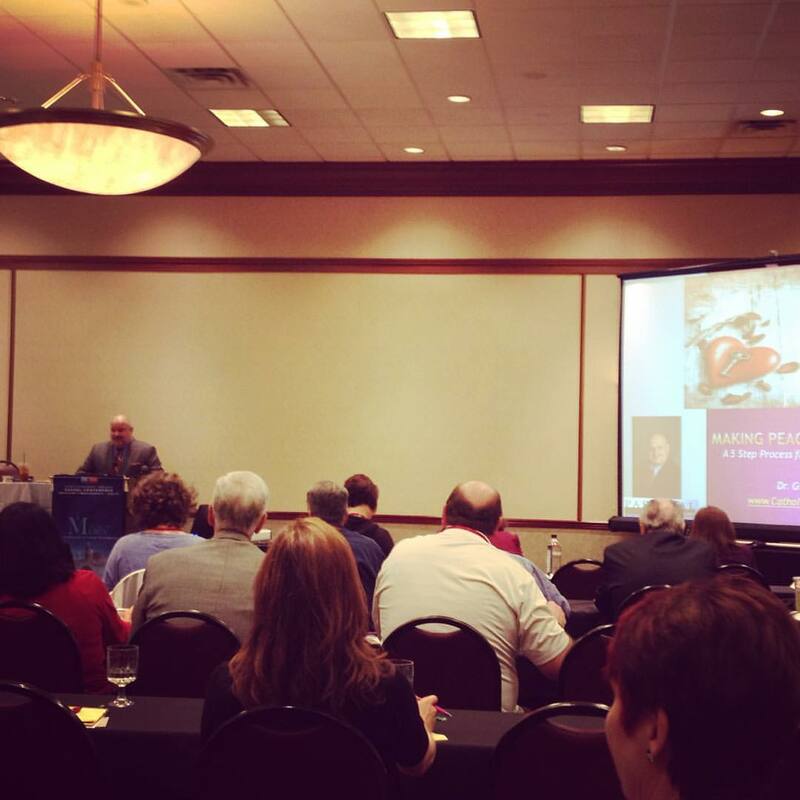 A HUGE thank you to all who put on this great conference, and a friendly “Come back soon y’all!” to all the Catholic professionals, therapists and religious who visited ATX for the conference!